Own Father Brown Series 2 DVD from Deff, DVD, Blu-Ray & 4K Video Specialists - Free UK Delivery..
Own Father Brown Series 3 DVD from Deff, DVD, Blu-Ray & 4K Video Specialists - Free UK Delivery..
Own Father Brown Series 4 DVD from Deff, DVD, Blu-Ray & 4K Video Specialists - Free UK Delivery.. Featuring all 13 episodes in the 1974 TV series starring Kenneth More, Father Brown is the creation of the great British novelist G.K. Chesterton, appearing in over fifty short stories. This Catholic Priest turned detective is both a rival and a partner in crime to such great sleuths as Hercule Poirot, Sherlock Holmes and Miss Marple, further enlivening the English appetite for a little murder and mystery with its afternoon tea. Specia..
Own Father Brown - The Christmas Special - The Star of Jacob DVD from Deff, DVD, Blu-Ray & 4K Video Specialists - Free UK Delivery..
Mark Williams stars as Father Brown, the crime-solving, mild mannered, intuitive, Roman Catholic Priest, in this acclaimed drama series based on the stories by GK Chesteron. Featuring all 10 episodes from the first series, Williams plays Father Brown wonderfully and is joined by a superb supporting cast..... in this glorious and rich production. The Hammer of God: When an ungodly man is murdered at the unveiling of a new church clock,..
Mark Williams stars as Father Brown, the crime-solving, mild mannered, intuitive, Roman Catholic Priest, in this acclaimed drama series based on the stories by GK Chesteron. Featuring all 10 episodes from the first series, Williams plays Father Brown wonderfully and is joined by a superb supporting cast..... in this glorious and rich production. 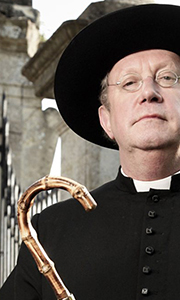 Episodes Comprise: Hammer of God: When an ungodly man is murdered at the unveiling of a new ..
Own Father Brown Series 1 to 4 DVD from Deff, DVD, Blu-Ray & 4K Video Specialists - Free UK Delivery..
Own Father Brown Series 1 to 6 DVD from Deff, DVD, Blu-Ray & 4K Video Specialists - Free UK Delivery..
Mark Williams stars as Father Brown, the crime-solving, mild mannered, intuitive, Roman Catholic Priest, in this acclaimed drama series based on the stories by GK Chesterton. Featuring all 10 episodes from the first series, Williams plays Father Brown wonderfully and is joined by a superb supporting cast... in this glorious and rich production. The Ghost In The Machine: Father Brown is sceptical when a parishioner believes she's being ..
Mark Williams stars as Father Brown, the crime-solving, mild mannered, intuitive, Roman Catholic Priest, in this acclaimed drama series based on the stories by GK Chesterton. Featuring all 15 episodes from the third series, Williams plays Father Brown wonderfully and is joined by a superb supporting cast Tom Chambers, Sorcha Cusack, Nancy Carrol and Alex Price in this glorious and rich production. The Man In The Shadows: Father Brown fi.. The loveably quirky Father Brown (Mark Williams) cycles back on to the screens for a fourth series of mysteries in the sleepy Cotswold village of Kembleford, based on the stories. Once again, he is aided by no-nonsense parish secretary Mrs McCarthy, glamorous socialite Lady Felicia Montague and her chauffeur Sid Carter. The Mask Of The Demon: Father Brown investigates the murder of a B-movie director when the production of Demon Brides ..
Own Father Brown Series 5 Blu-Ray from Deff, DVD, Blu-Ray & 4K Video Specialists - Free UK Delivery..
Own Father Brown Series 5 DVD from Deff, DVD, Blu-Ray & 4K Video Specialists - Free UK Delivery..
Own Father Brown Series 6 DVD from Deff, DVD, Blu-Ray & 4K Video Specialists - Free UK Delivery..